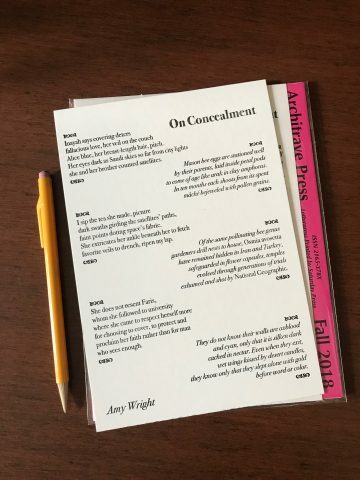 Amy Wright is the Nonfiction Editor of Zone 3 Press and Zone 3 journal as well as the author of three chapbooks—Farm, There Are No New Ways To Kill A Man, and The Garden Will Give You A Fat Lip, which won the 2012 Pavement Saw Chapbook Contest. Alice blue, her breast-length hair, pitch. she and her brother counted satellites. to come of age like Arak in clay amphoras. mâché bejeweled with pollen grains. faint points dotting space’s fabric. favorite veils to drench, ripen my lap. exhumed and shot by National Geographic.